24 Hours in Beaufort, S.C.
36 Hours in Pinehurst, N.C.
Misadventures of a new-ish mom in Southern California. The notebook I’m using as my reference for our cross-country trip has the words “I’m going to be the boss and this is my plan” on the cover of it. I bought it with the intention of jotting down ideas for future stories and businesses, yet somehow it turned into a road trip diary. I love picking it up and reading where I left off, usually several years earlier. The first few pages of this small blank notebook have chicken scratch about Ireland (trip taken in ’09) and the second chapter includes notes on my first trip across America (’10). Which brings us to April 5, 2014 — the end of our first full day on the road from Los Angeles to South Carolina. The night we left El Segundo (at 10 p.m. thanks to the late arrival of our movers) we made it to Palm Springs, where we stayed at a Quality Inn. Cheap, but not recommended. The woman who checked us in at the front desk looked like she’d had a rough go of it and she was not giving out the warm fuzzy vibe I was looking for after a brutal week in moving hell. I could not get out of the lobby quick enough. 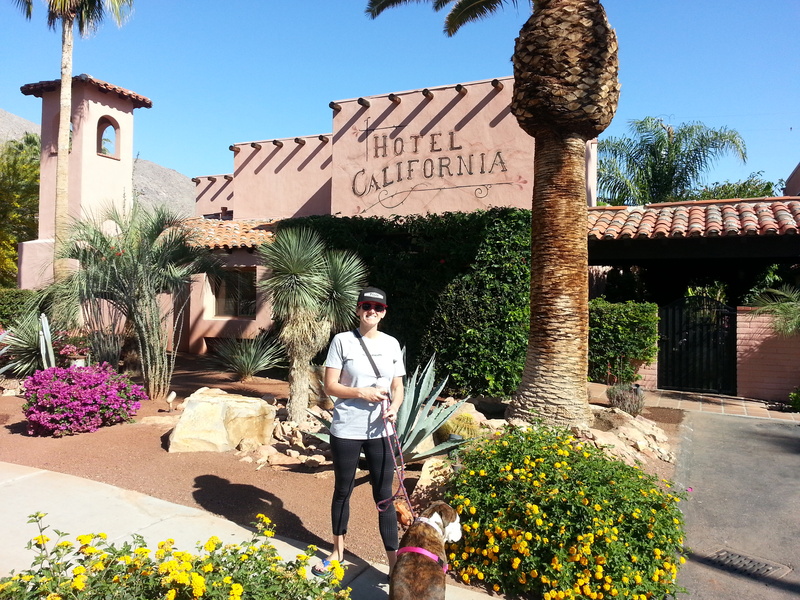 The only bonus was the place was dog-friendly and it was on a decent walkable street, Palm Canyon Drive, where we cruised for about 40 minutes the next morning with Agnes and stopped for an Instagram photo at the Hotel California. We finally decided on what the family hashtag would be, for now and future road trips, #fikescrossamerica. We wanted to get some coffee before we hit the road so we stopped at a place called Koffi, where we sat for a few minutes chatting with a gay couple. The two elderly gentlemen loved Agnes and told us about the many dogs they’d had during their lifetimes. Dog people can be cute and chatty that way. The coffee and company were great, my scone wasn’t, though MainMan enjoyed his yogurt and berry parfait. Before we mapped out the trip, the only place I knew I wanted to stop was the Grand Canyon. I’d never been and I felt it was worth our efforts to see. We took the 10 to the 177 to the 40. Once we got off the 10, we were on the road to being car sick. Rt. 177 had more small inclines and dips than the Grizzly roller coaster at Great America. If you drove 10 miles over the speed limit you’d end up flying off one hill and landing on the next. I wasn’t looking to throw up my scone or coffee, so I squealed at MainMan a few times to take it easy. At one point, MainMan spotted a road runner about 100 yards in front of us. It moved exactly like you would picture — its legs were barely visible as they fluttered faster than a hummingbird’s wings beneath its upper body, which seemed to magically zip from one side of the two-lane road to the other before it disappeared from sight. Luckily we arrived at Grand Canyon National Park at the perfect time — shortly before sunset. We were excited and relieved we could take dogs on some of the trails, as we know some national park trails are not dog-friendly. We stopped at a couple places along the south rim where we could walk Agnes — the Greenway and around the Yavapai Museum. 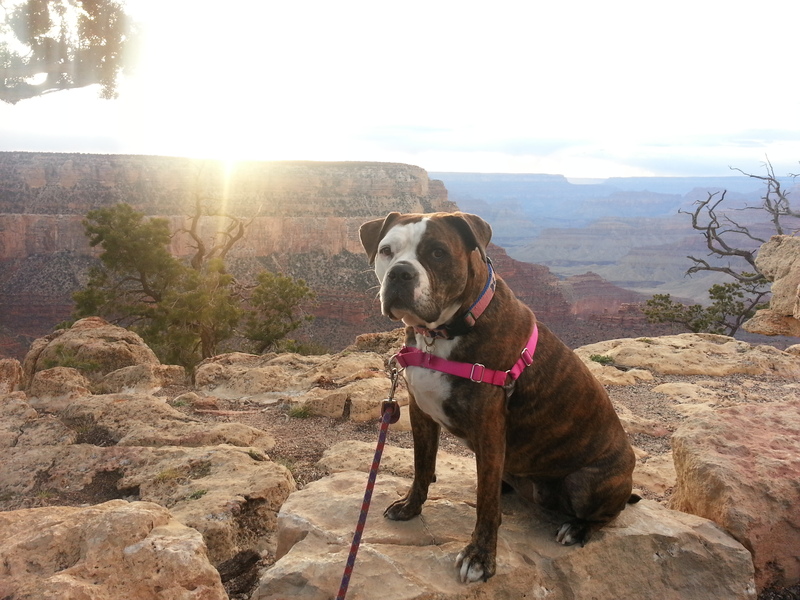 I’d read about the Bright Angel Trail, which was about 1.5 miles down a canyon to an old house, and I’d really wanted to do it, but sadly no dogs are allowed to walk down below the rim. We spotted elk on the drive into the park, and we got really close to them in and out of the car within the park. Agnes loves cows and horses, at least she seems to when we look at them through fences, and she was equally excited/alert about getting to know a few elk. They stared her down, more than they stared at us humans, but they weren’t interested in getting acquainted. The Grand Canyon looked like a monstrous cake God once took a knife to so he could see what the inside layers looked like. And there were many layers. Millions and millions of years of layers. I’m sure the colors are breathtaking at all hours of the day, but the pale, rusty orange hues were exceptionally mind-blowing at sunset. I love photographing trees and I found branches served as perfect frames to the slices of the Grand Canyon I wanted to remember years from now looking back at albums and scrapbooks of our adventure. And Agnes posing above was probably the photo of the entire trip. Once we left the Grand Canyon, we drove to Flagstaff along Rt. 180. It was a frightening drive because a) we were the only ones on the road and it felt like we were driving through a windy black hole and b) we came to a screeching halt a few times after nearly coming bumper to muzzle with small elk families. I was driving and had to rely on MainMan’s eagle eyes, but it was still nerve-wracking. Ninety minutes, a layer of sweat and a stress-ache later, we made it to Flagstaff, Ariz. Little did we know it was in the mountains and it’d be freezing when we arrived. I was severely under-dressed layer-wise, but luckily I had a Carhartt vest in the back of the car I dug up and threw on to walk Agnes before we grabbed dinner. We stopped at the Altitudes Bar & Grill, which we found on Yelp. 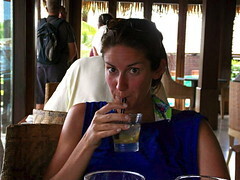 We were happy to discover it was a cozy, local dive-bar-meets-ski-lodge. A woman was singing, not so well, towards the back. I ate one of the best quesadillas I’ve ever eaten in my life and I’d eat there in a heartbeat if we ever went back. That night we stayed at the Howard Johnson Inn. Who knew those were still around? MainMan had never heard of them. Once again we were met by a sketchy front desk attendant, seemed to be the theme of the trip so far, but we couldn’t complain too much since they allowed dogs. I'm a new, bumbling mom to Harrison (8/15/16) and my husband and two rescue pets help me every step of the way. W+Q is the third incarnation of what began as a New York-based restaurant blog 12 years ago. Come along with me as I navigate our life as new parents in San Diego.